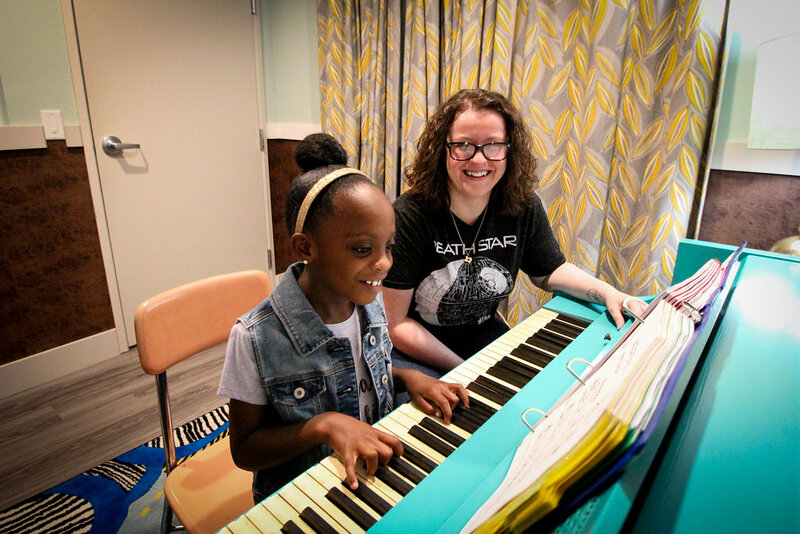 At Creative Soul, we focus on fundamentals of good piano playing while introducing modern or popular music that students want to learn or currently listen to. This approach keeps students excited and earns them recognition from their peers. Students will learn sight-reading, theory, chords, transposition, and improvisation. In the past, the was a “no pain, no gain” philosophy regarding piano technique. But thanks to physical medicine and the study of ergonomics that philosophy is no longer valid with piano technique. Creative Soul instructors have been trained to use a contemporary technique that facilitates good development while playing all styles of music. Historically acoustic pianos have been the instrument of choice for most lessons. But recent technology has lead to digital pianos that have sampled sound from the world’s finest concert grand pianos. These keyboards are fun and provide an opportunity for an intense and special learning experience, where students can use many voices built into these electronic keyboards, making them into any instrument, band or orchestra. Some of these instruments they have never even heard of. At Creative Soul, we have both so that our students have the opportunity to play on a real acoustic piano and experience the keyboard technology so they do not miss out on the fun.